"Change is hard," we say, and it is even harder when it is thrust upon us. At any point, we may be forced to reinvent our career or downsize our lives; we may lose a love or a dream. Our first reaction is to rail against fate, but what if we could see past today's turmoil and spot tomorrow’s opportunities that lie within unasked-for change? 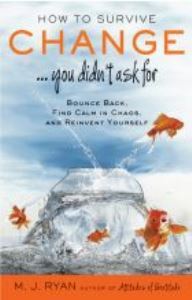 That’s the promise of How to Survive Change...You Didn't Ask For by bestselling author and executive coach M.J. Ryan. Her paradigm-shifting book will help you bounce back, do more with less, rise to challenges, see new opportunities, find calm in chaos, reevaluate priorities, and reinvent yourself. In How to Survive Change...You Didn't Ask For, Ryan provides strategies to retain your brain and optimize your response to change, step-by-step: by first accepting the new reality, then expanding your options, and finally, taking effective action. She offers cutting-edge tools for becoming calmer, less fearful, and more flexible, creative, and resourceful in your thinking. Best of all, as your adaptability increases, so does your confidence—with her guidance, you will be able to survive and thrive no matter what life throws your way.